A funk has settled over the city. Maybe it’s the crazy changes in weather, maybe it’s the brutal nasal congestion that everyone (including me) is suffering from, and maybe it’s just that it’s still February. In spite of all that, Shabbat managed to be a bright spot in the week, though to be fair, I slept through most of it. Also, in my pre-Shabbat haze, I once again failed to take pictures, so use your imaginations, though feel free to imagine sunshine and flowers in place of food if that will make you happy. 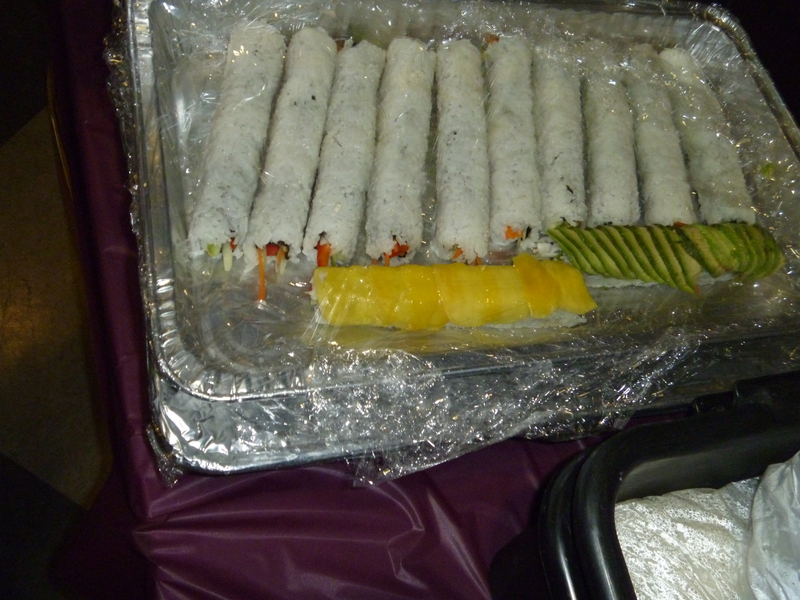 Friday night, Dahlia hosted a potluck for the Grad Network, and it was really lovely to see so many new people there. Two students told me that they had such a good time at the “big dinner” last week, that they decided they wanted to go to a Shabbat dinner again this week. That pretty much made my night (and flew in the face of my “people only celebrating Shabbat once a year” rant from last week)! My potluck contributions were baked ziti and hummus, both incredibly easy crowd pleasers. Recipes at the end. Aaron made wasabi tofu, based on what I remember of his description, simply by pressing the tofu and marinating it in a pre-made wasabi sauce and roasting at 400 until browned, flipping once. He cut the pieces much larger than I usually do, which I found gave it a really hearty consistency. Laura made donut muffins for dessert, and I’ll include the recipe shortly. I was worrying about the real food to dessert ratio, but it was one of those perfect potlucks where there was the right amount of everything. Saturday was a Minyan Tikvah day, which means a bright spot not only in the week but also in the month. Services were seriously fantastic: the davening, the crowd, the whole vibe of the morning. (It all went so well, it’s not even worth mentioning the 35 minutes we spent outside before we could get into the building.) Ariel planned a summer-themed kiddush, complete with popsicles and lemonade, which was fun and yummy, but it may have fueled some more sun-deprived angst. Ilana hosted lunch, no small feat when an unexpected 35 people came over. But, as always, she hosted with grace, there was plenty of everything, and it was all delicious. And then I came home and slept for three hours. While that kind of serious nap definitely had more to do with my cold than with having a big lunch, the sesame noodles and pumpkin mousse didn’t hurt. Dar Williams said it best, and I can’t get it out of my head: “February was so long that it lasted until March.” Fortunately, that’s only a few days away. Put it in the food processor. Eat with pita chips. Yum. If you don’t have a food processor, call me, and I’ll make some for you. Cook the pasta. Mix everything together, but save some of the mozzarella to sprinkle on top. Cover with foil and bake at 350 for 40-ish minutes. Uncover near the end if you like the top crispy. Comfort yourself with food and wait until spring. 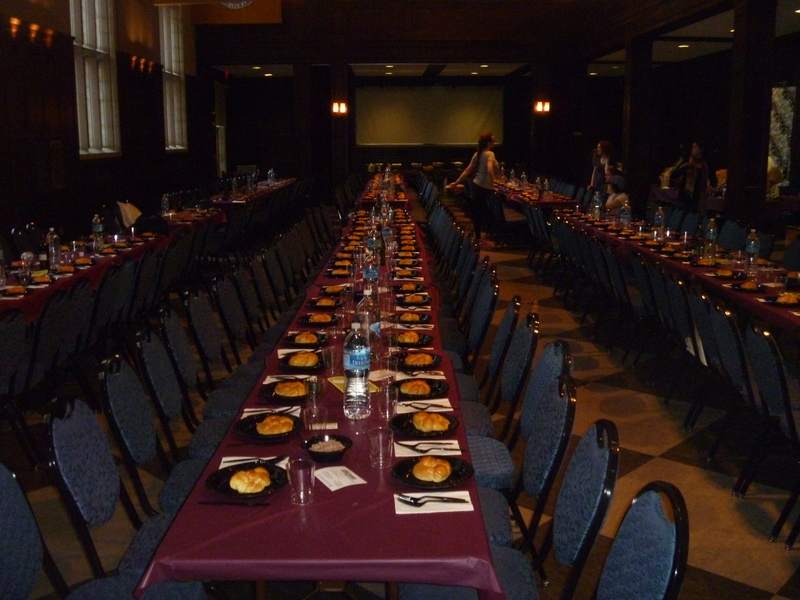 This was the 9th year of the Penn-wide Grad Student Shabbat dinner, and my 5th year running this extravaganza. And it really is extravagant: Set tables for 300 with every seat filled, freshly made sushi on site, open bar, students from all the graduate schools at Penn. It’s really a scene, and I mean that in the best possible way. When I say “running the event,” this year more than ever, that “running” really meant “watching” (ok, and list-making). This event is in partnership with Lubavitch House at Penn, and between them (thanks, Jen!) and the unbelievable students who devoted so much time to making this dinner happen, I actually didn’t feel like I did that much. In the many hours of prep leading up to the event, I watched students carry tray after tray of chicken and bottle after bottle of vodka into the room. 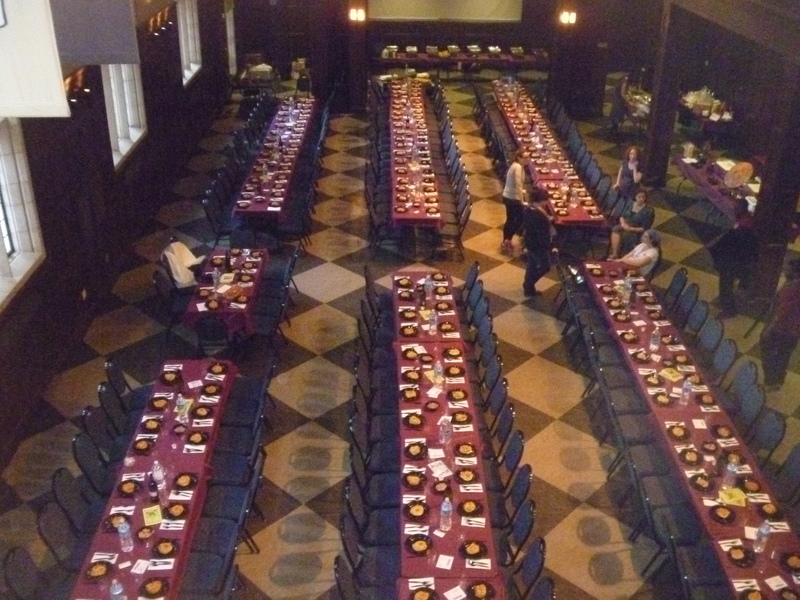 I watched the room transform from a career fair to a Shabbat space. I watched Marc, yet again this year (with incredibly generous help from Suzanne and the security guards), struggle to hang up our banners and, of course, make them look perfect in the end. In the many hours of the dinner itself, I watched 300 people flood the room, but in such a way that crowd control wasn’t an issue. I watched students meet each other, and make plans to meet again. I watched people’s eyes flit to my belly and realized who I hadn’t seen in a few months. I watched this extraordinarily kind mob celebrate Shabbat together. I have a love/struggle relationship with this dinner. I love it because it’s big and beautiful and the attendees are happy and glowing and it’s quite an accomplishment to pull off, but I struggle with it because for a lot of the people there, this is their Shabbat for the year. It’s not just an atypical Shabbat, to be there with so many people, it’s an atypical Friday, to acknowledge Shabbat at all. I think that celebrating Shabbat once a year is better than never celebrating it, but when I contrast dinner Friday night with lunch on Saturday, I truly wish everyone had both experiences in their repertoire. Ilana brought lunch (and Alex), and the four us had the calmest meal ever. Yes, it was the perfect antidote to Friday, but it was also, in a kind of pure sense, the perfect antidote to the week, a real distinction between Shabbat and everyday. Oh yeah, and we ate well, too: pasta with creme fraiche (plus garlic, salt, parmesan, and, for everyone else, smoked salmon), Israeli salad, the most delicious roasted asparagus, and brownies, grapes, and chocolate ice cream (Marc’s contribution) for dessert. We ate slowly, told stories, took seconds, and I took a deep breath for what felt like the first time all week. Then we moved to the couch, browsed magazines, talked, and had no rush to be anywhere. There are no recipes this week (unless you count the tip that creme fraiche and sea salt improve basically any food), just the acknowledgment that this was an exceptional week in a lot of ways, and like every other passage of time, now it’s gone, and there’s a new week to look forward to. Last night was a Shabbat/salon at our place. The Grad Network salon series started about three years ago, and while it has changed a lot during that time, the basic premise is the same: get together for Shabbat dinner, then discuss an article of interest over dessert. Sara has been instrumental in keeping these going for the last year or so, and she picked the article and facilitated the discussion last night. The article was about the All-of-a-Kind Family books, which some people remembered fondly from their childhoods, and other people didn’t know at all. But, as usual, the salon discussion veered off to a general discussion of Jewish identity, and everyone found something to relate to. And, when Marc didn’t, he referenced the science fiction books and Mel Brooks movies of his childhood. I was especially excited because we also got to discuss the K’ton’ton books, which were pivotal in my own childhood. In addition to the great discussion, the food all came together really nicely. We had a crockpot lentil chili that I made for the first time (not something I usually do when hosting) flavored with molasses and apple juice. I also used my cast iron skillet for the first time (thanks, Janet!) to saute onions for the chili and for the spinach casserole at the same time, which was really efficient! Sara also made her now-famous kamut flour challah (scroll all the way down for the recipe), and since she baked it at my place, I got the benefit of the house smelling like challah without having to do any of the work. That also means that Sara and I got to hang out all afternoon while all this cooking was happening, and that was a serious added benefit. Today, Minyan Tikvah hosted off-week lunches, which means we had meals with Minyan Tikvah folks without a minyan meeting beforehand. Beverly and Naomi hosted us, and we ate really well, then kept eating all afternoon. And, since I’m still at their house, yup that’s right, I’m still eating the amazing lunch food (and there’s pizza in the oven!). I also learned about Beverly and Naomi’s policy to tell new guests who have never been over before not to bring anything but themselves. It’s a really nice way to make people feel especially welcome! There were way too many great recipes this Shabbat to share them all, but here are a few. And if you want to request any other recipes that aren’t included (or if you made something and want to share the recipe), just let me know! Heat the oil in a large skillet over medium heat. Add the onion, bell pepper, and garlic, cover, and cook until softened, about 5 minutes. Stir in the chili powder and cook 30 seconds longer. Transfer the mixture to a 4-quart slow cooker. Add the lentils, tomatoes, molasses, and allspice (I don’t have allspice, so I used some ginger and cinnamon) and season with the cayenne, salt, and black pepper. Stir in the water and apple juice, cover, and cook on Low for 8 hours (I cooked it on high for 5 hours or so). Add more water if the chili gets too thick — this is what the directions say, but I actually thought it was too liquidy. This might be because I adjusted the cooking time/temperature. I think next time I’ll use a little under a cup of apple juice and only 1 cup of water. I also think diced tomatoes instead of crushed would add nice texture. I doubled the recipe, and it served 12 people with lots of leftovers, which I’m excited to eat with soy hot dogs. 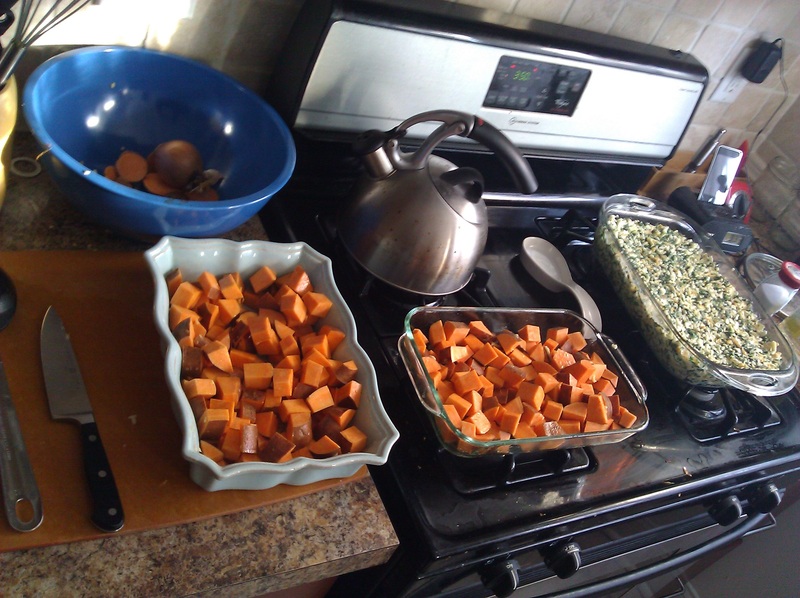 Mix together in 9×13 pan (makes fewer dishes!). Cut in a stick of cold butter like you’re making pastry dough. Add 1/4 cup oil. It’ll be crumbly like biscuit dough or pie crust. Push it into the pan to make it as flat as you can. Bake at 350 for 20 minutes until the edges are sort of brown. Immediately after removing it from the oven, spread a layer of apricot jam then sprinkle with chocolate chips. After sitting for about 5 minutes, the chocolate will be melty and spreadable. Let it cool before devouring. With any luck, there’ll be some left for the actual meal. Writing on Tuesday night close to midnight is, perhaps, a far cry from immediately after sundown on Saturday. But I remember learning somewhere that you can wait as long as Tuesday to do havdalah, if absolutely necessary, so this feels legit. I should find a source for that. 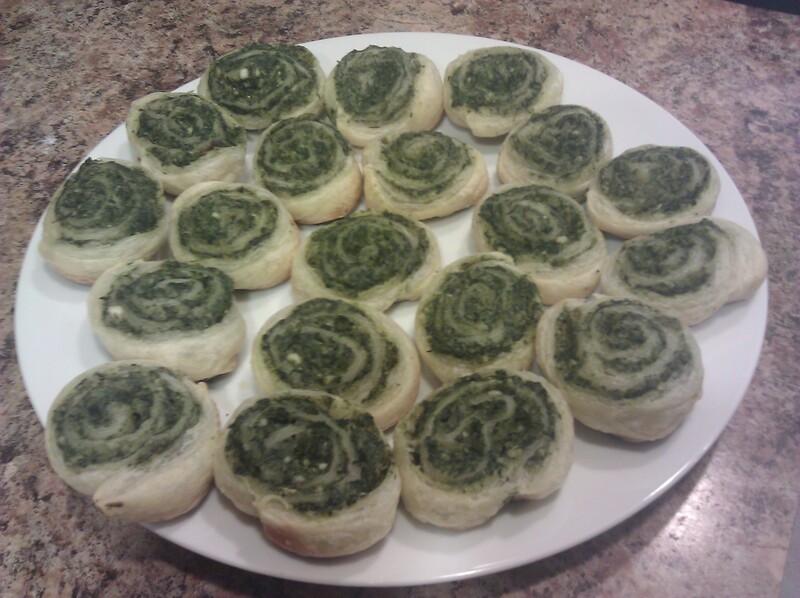 My contribution to the potluck was spinach pinwheels, the spanikopita filling I’d made for my birthday wrapped up in puff pastry. It’s a good thing I’d blogged about making that filling, since I had to consult my own recipe to make it again. 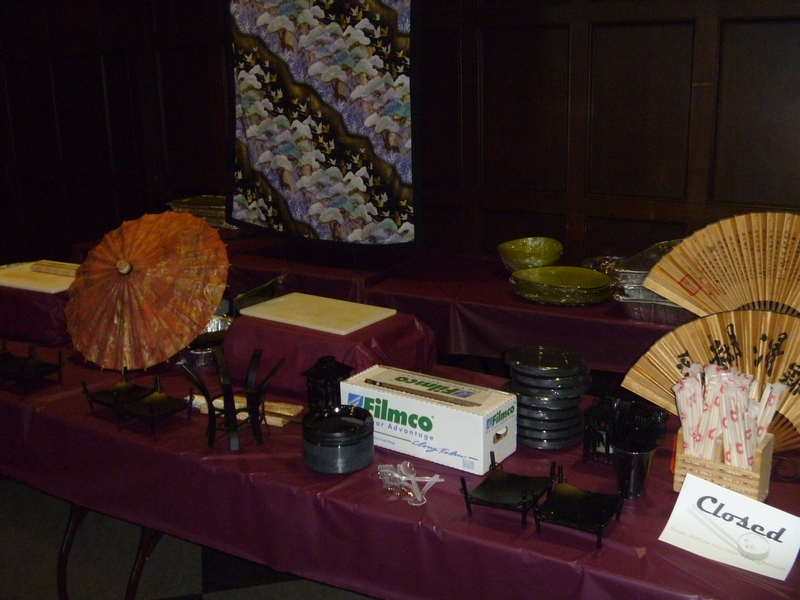 The food was great, and I talked to several people about how they made what they brought. For all the cookbook-reading and recipe-sharing that gets talked about, over and over I heard that people couldn’t recreate their own recipes. It was a lovely, if somewhat frustrating, theme to emerge, especially since I really wanted recipes! Edward made fantastic rice and lentils, much better than what I made a few weeks ago. He didn’t follow a recipe, but he did tell me about making them. He caramelized the onions for an hour or so, cooked the lentils, added the rice to the lentils and cooked that (I can’t quite picture the cooking times for all this, but it seems to have worked), then added some butter, salt, more salt, and probably another spice or two that I’m not remembering. Rebecca told me I could rephrase or clean-up her recipe, but no need: it’s such a liberating semi-description of how a lot of good ingredients can turn into a great meal! I had several conversations last week, unconnected to each other, about how cooking is something tangible and satisfying that we can do for ourselves. When your to-do list goes on forever (and you add “shower” and “eat” just so you have something to cross off) and long-term projects have no end in sight, you can still chop some veggies, make some rice, and have a concrete accomplishment in front of you. The moral of the story here is that experimentation with food pays off. And even when it doesn’t in terms of taste, or in terms of time that you “should” have spent doing something else, it’s still a valuable, hands-on experience. Something, plus a little time, turns into something else that can feed you. Learning that, like me, so many of my friends often cook without recipes, makes me wish it weren’t quite so late at night and I could figure out the right metaphor to compare this experience to the rest of life. Maybe it’s that we all think that everyone else knows what they’re doing, but really everyone is making it up as they go along. Maybe it’s that there’s no right way to do anything, and every moment, every dish, is a reinvention. Maybe it’s that it’s ok to pour your heart and soul into something not knowing how it will turn out. Whatever it is, I’m glad I had the experience of eating all these lovingly created concoctions with so many lovely people.